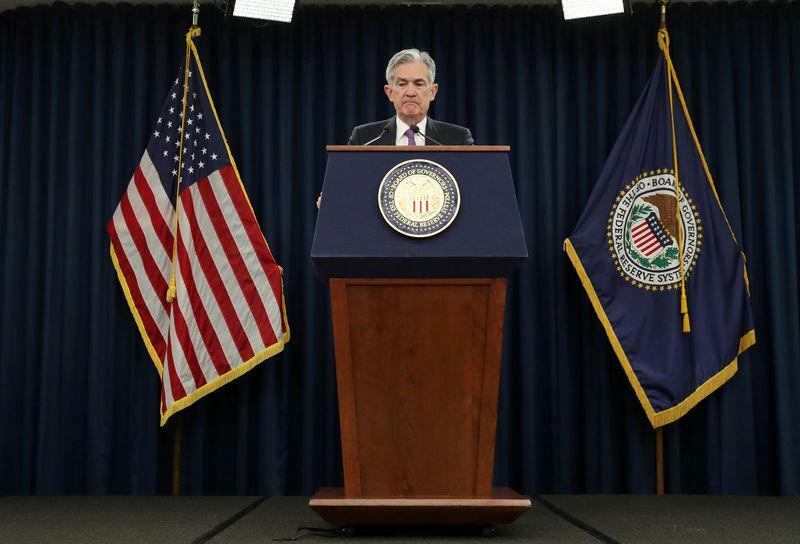 It's just over a week since the U.S. Federal Reserve formally paused its rate-rise campaign, but central bankers around the world are falling over themselves to imitate Jerome Powell's dovish turn. Australia's Philip Lowe, having said for a year the next rate move was up, suddenly declared rates could go either way. The European Central Bank can hardly cut its minus 0.40 percent rate, but a new round of bank funding stimulus is now widely expected. The rate cycle has turned across emerging markets, too -- India has cut rates for the first time in 18 months; several others including Brazil have hinted at cuts ahead. And upcoming central bank meetings in New Zealand and Sweden are sure to highlight growth concerns. The shift is showing up on currency markets. The dollar fell in December and January as the Fed pause was priced in. Now it's everyone else's turn: the Aussie has lost more than 2 percent since Lowe's Feb. 6 comments; the euro has had its biggest weekly drop in four months and MSCI's emerging currency index is retreating after rising three months straight. If everyone joins the Fed in the doves camp, the dollar, with the highest interest rates in the G10 group, may resume its ascent. Analysts reckon it has stalled but only time will tell. Less than 50 days before Britain's EU departure date, markets' conviction that a no-deal Brexit will be avoided may be starting to fade. There is not that much Prime Minister Theresa May can update UK lawmakers on when she addresses them on Feb. 13. This will be followed by debate in parliament where lawmakers can propose changes. That caution has rippled into cash markets. The pound has fallen back below a key technical market level -- the 200-day moving average, an indication investors are no longer bullish on the currency's prospects. In fact, sterling has traded below that average since May 2018, only briefly popping above i in January. If talks collapse and tariffs increase on March 2, it will spell more pain for China's economy -- and the rest of the world. In turn it will increase pressure on Chinese policymakers to ramp up stimulus at next month's parliamentary summit. For months, the question on a lot of people's minds has been whether the U.S. economy is headed for recession, but it looks as if the euro zone could get there first. The European Commission shocked markets by slashing growth and inflation forecasts for the bloc. Thursday's release of the flash gross domestic product data is likely to show the region grew 0.2 percent in the fourth quarter. Evidence is already piling up that Germany, the bloc's largest economy, was teetering on the brink of recession towards the end of 2018 due to global trade headwinds and a cooling Chinese economy. Clouds are gathering on the horizon for the world's top economy -- global growth headwinds and the trade war are taking a toll while another government shutdown may be lurking around the corner. Markets will be scouring various U.S. consumer and producer inflation data out in the coming days to see just how accommodative the Federal Reserve can be after Chairman Jerome Powell said in January the case for raising rates had "weakened". The Fed's post-meeting statement had also dropped its earlier expectation for "some further" tightening. The U.S. government has also endured a 35-day government shutdown that ended on Jan. 25, cost the economy at least $3 billion and inflicted hardship on unpaid workers. Lawmakers are resisting President Trump's demand for funds to build a Mexican border wall. They have until Feb. 15 to find a compromise.